Posted by WorldbyStorm in Irish Left Online Document Archive, League for a Workers Republic. Firstly, many thanks to Rob Marsden at The Red Mole Project for the scan of this document and forwarding it to the Archive. Rob has been good enough to scan another document or two which are of relevance to the Irish Left. For anyone not familiar with The Red Mole Project it provides an huge archive of Red Mole and associated publications and material. This document from 1981 from the League for a Workers Republic is first and foremost concentrated on the death of Bobby Sands on hunger strike. It joins this document from the LWR published a few years later. At that point the LWR was the Irish Section of the Fourth International (International Centre of Reconstruction) and a full overview of the organisation can be found here. The British Government has cold-bloodedly murdered Bobby Sands. The British government intransigently refused to concede the just demands of Bobby Sands, for which he fasted to his death. It refused, despite the democratically expressed wishes of the people of Fermanagh-South Tyrone, who voted for Sands and his demands. It refused despite the tens of thousands of appeals from members of the labour and democratic movement world-wide. It also blames Charles Haughey, ‘[who] refused to publicly demand Britain concede… and refused to meet the elected councillors of Fermanagh/South Tyrone… refused to meet the national H-Block Committee… ‘ and it calls for the ‘British Ambassador Out!’. It also argues that ‘now is the time for continuous stoppages, for strikes and demonstrations, for a general strike to force Thatcher to concede and to save the other hunger strikers’. There can be no place in the Irish labour movement, in the movement founded by Connolly, for those who now stand by Britain’s murderous policy. Only those union leaders who support the actions of the workers against Britain have any place in the labour movement. Other pieces include an LWR reply to Peoples’ Democracy, where it takes issue with an article in the paper of Peoples’ Democracy about the LWR entitled ‘An Infantile Disorder’. There is also an article on ‘Electoral Strategy: Against Participation in Leinster House’ which restates the LWR’s fundamental antagonism to participation in either Westminster or Leinster House parliaments. This document issued in May 1983 was published by the League for a Workers Republic, at that point the Irish Section of the Fourth International. For an overview of the LWR see here. …no prominent trade union leaders or political figure has supported Matt Merrigan’s call. instead the ICTU leadership has stated that they are encouraged by the anti-tax evasion measures in the Finance Bill. This Bill, now going through the Dáil implements the PAYE increases. But the ICTU want stoppages to cease and lobbying of individual T.D.’s to take place instead. British rule in Ireland has been challenged by the heroic workers and youth of the occupied 6 counties for over ten years, supported by their brothers and sisters in the South. There are a range of articles engaging with topics such as Trades Councils, an account of a Polish strike committee organizer and founder of the Polish Socialist Workers’ Party at his trial by the Polish regime and reference to the anti-abortion amendment to the Constitution, which had yet to be determined. There’s also an editorial that criticises Brendan Doris [of CPI M-L] and Joe Duffy, then the leadership of the Union of Students in Ireland, for not running a national campaign or press conferences against education cuts. Careful study of the names of those involved will point to one or two familiar to the Left Archive. Posted by leftopenhistoryteam in Irish Left Open History Project, League for a Workers Republic. In early 1970 a group within the LWR left the organisation. This group ‘supported the International Committee of the Fourth International [ICFI] [and] demanded immediate affiliation of the LWR to the ICFI. This was unacceptable to a majority of LWR members, despite overall political agreement with the IC, because of a remaining lack of clarity on certain questions, and unease over various aspects of the IC’s politics, notably the positions of the British Socialist Labour League on Ireland’ (Workers Republic, April 1974). Dermot Whelan was among those who left in 1970. This group became known as the League for a Workers’ Vanguard, later simply Workers’ League. It was linked with the Socialist Labour League. In 1972 there was a split within the ICFI, and the breakaway group, which was free of SLL influence, became known as the Organising Committee for the Reconstruction of the Fourth International (OCRFI). The LWR affiliated to this breakaway group. 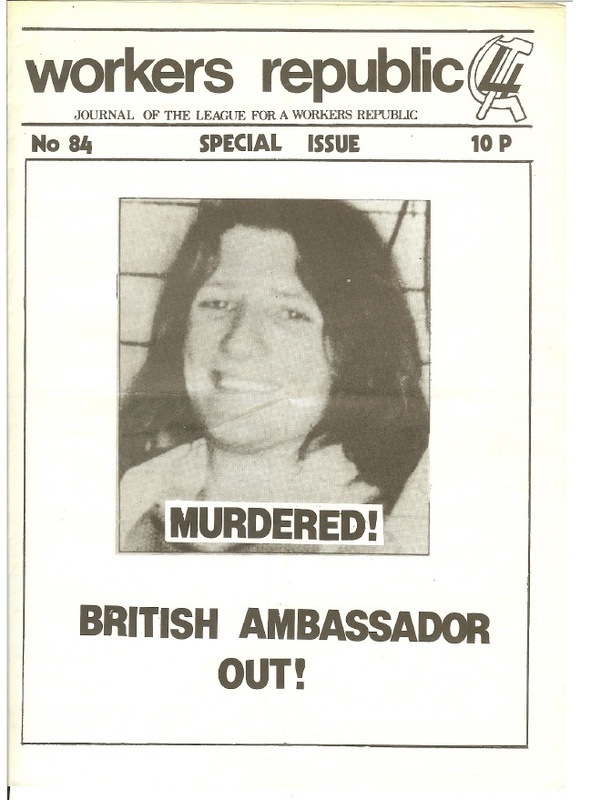 Dermot Whelan rejoined the LWR in 1974, and wrote a pamphlet which outlined his analysis of the SLL (available here, 2MB). In June 1974 a newspaper called Young Socialist began publication. Its office address, 13 Lower Camden Street, was the same as that for Revolutionary International, and was published concurrently. It contained an article from the Drogheda Young Socialists, as well as a copy of the Young Socialist Manifesto (click here). 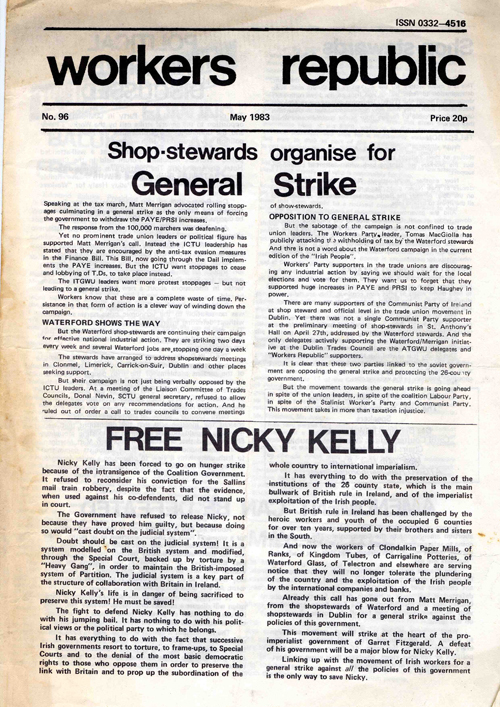 In May 1975, Workers Republic carried an article on recent student elections in TCD. It mentions two of the candidates, Carol Coulter and Anne Connolly. In April 1976, Workers’ Republic changed format, and became bi-monthly. The articles were longer, and more in-depth. Publication of Revolutionary Struggle was suspended, “as Workers’ Republic will fulfil its function.” Contributors to this theoretical/discussion publication included Willie Ryan, Carol Coulter, Harry Brent, Anne Williamson, Mary Quigley, Frank O’Reilly, George White, Seamus O’Brien, Frank Smith, Mary Johnson, Chris Connor, Terry Brennan, John O’Hara, Margaret Grey, and Frank Smith. The LWR also participated in the Socialist Labour Party, and although it never formally dissolved, by the late-1980s the group had ceased to have any form of a noticeable presence.